The right basis for your success – we can also create a pleasant working atmosphere in our flexible conference rooms. The conference rooms are separated by mobile walls or can be joined together in any combination. They are lit by daylight, can be darkened at random and each has its own separate access to the outdoor terrace. 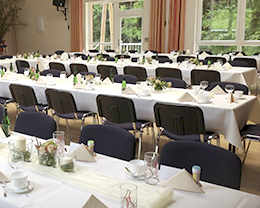 This means that your conference participants can enjoy a fantastic view of the Ore Mountains during breaks. They can quickly clear their heads for new input by taking a walk round our gardens. Conference room equipment, catering, overnight stay for participants. There follows a selection of conference package offers that should make it easier for you to plan your event. We will be pleased to make individual adjustments to cater for your needs. We will be happy to help with the planning of your conference and organisation of the fringe program. A carriage ride, “Bergquartal” or “Mettenschicht” in the underground section of the nearby Lengefeld lime works, a distillation demonstration on the premises of the liqueur manufacturers Ernst F. Ullmann (“Lauterbacher Tropfen”), indoor climbing and high rope course in the Strobelmühle Pockau, classic or comedy dinner and theatre shows, wine tasting with our sommelier, indoor & outdoor show cooking, barbecue buffet and more. We will be pleased to make you a concrete offer for your conference as soon as we know the exact dates. You can contact us by phone, e-mail or personally in the hotel for more information and advice. Simply give us a call or send us your data using the contact form – we always have a sympathetic ear for even the most unusual of wishes! If you are in the area, why not drop by personally and convince yourself of the location and equipment. Your contact persons for seminars in the Hotel Waldesruh are Mrs. Silke Nieschalk or Mr. Jörg Nieschalk.